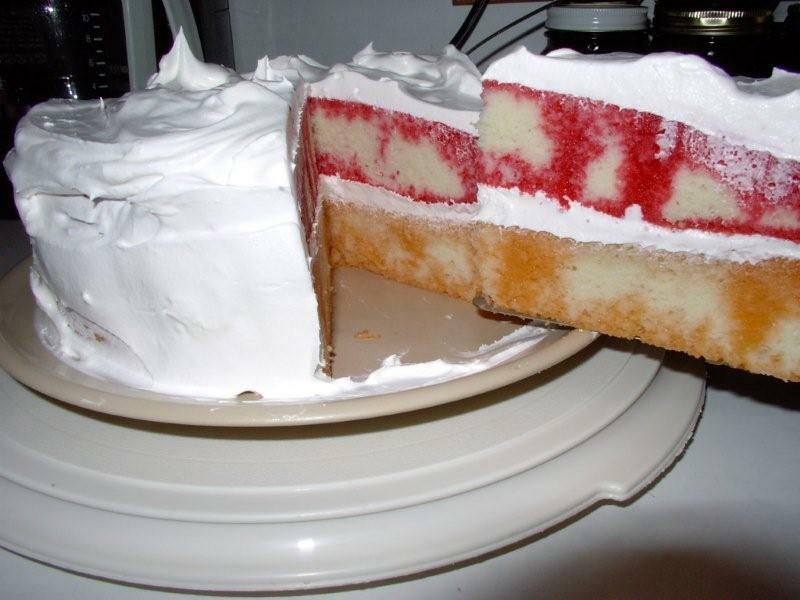 Quick and easy to make from things usually on hand - all you need are a box of cake mix, 2 small boxes of Jell-O and some Cool Whip. What could be easier? We generally use a red fruit flavor and lemon-lime for the flavor choices but any of the Jell-O flavors will do nicely. The colors are festive and will go with most any occasion. Keep cake cold before, during and after frosting. If the whipped topping gets warm, the layers will slide apart. Several large toothpicks or bamboo skewers can help hold the layers together until time for serving. Place cake layers, top sides up, in 2 clean layer pans. Prick each cake with utility fork at 1/2-inch intervals. Dissolve each flavor gelatin separately in one cup of the boiling water. Carefully spoon one flavor over individual cake layer allowing the liquid to fill in the fork puncture holes. Repeat for second cake layer and second flavor.Chill 3 to 4 hours. Dip one cake pan carefully in warm water for 10 seconds to losen gelatin. Turn out onto serving plate. Top with 1 cup of the whipped topping. Unmold second cake layer and place carefully over the first layer. Frost top and sides with remaining whipped topping.